My creation of a possible afterlife experience is based widely on the works of Frederick W. H. Myers, who was a creative scholar and one of the founders of the Society for Psychical Research. He is reported to have communicated with some diviners all over the globe shortly after his death. His aim is reportedly to prove that he still is in existence, even after his demise, via relaying a sequence of messages to different mediums. In his theory, he asserts that life after death has stages, each of which has its own entry phase, a short development period, and a preparation period for the next stage in the hierarchy. In most cases, individuals get impression that it is the creator who tries to “take into the firm,” as many junior members as possible according to their qualification (Williams 2014). The overall number of stages he developed is seven. They have such characteristics as consciousness and domains of existence. The description below analyses levels that Myers suggested and compares them with my version and opinions of life after death. The first stage is that of the Earth domain. The period of earth experiences have been understood thoroughly via reincarnation or interactions with individuals on other domains. After the life on Earth, a person can proceed to other domains that cannot be reached by him/her while they live on Earth. Upon death, an individual enters the second stage, also known as the intermediate domain. According to my version, during this domain, when an individual is about to die his/her life flashes in the mind and it is then that the reality appears. The kind of life the individual lived, either righteous or evil, reveals itself and it is during this stage that a person apologizes for wrongs committed or makes the last wishes. The second stage is characterized by persons undergoing a heavenly judgement on their way to heaven. Bad people pass through the left door while the righteous pass through a tunnel with a bright light. The evil are to enter an abyss of sadness, emptiness and nothingness for a while, and then they are reincarnated back to the world. The suicides are sent to the holding place where they are tasked with deciding either to proceed through the left door or accept God and follow the light instead. The holding place is similar to the purgatory and individuals here stay for a while until they arrive at a decision. This stage in my afterlife experience is the day that comes immediately after death, when people are unconscious, whereby they rest while reflecting on what they did while they were alive. The choices here are either to proceed as a supernatural being or die without apologies. After the stage two, an individual proceeds to the domain of illusion, which is the third stage. This domain is characterized by the mind creating and shaping things through the use of imagination. However, no matter how long a person stays here, a decision has to be made eventually. The person either goes back to the Earth or moves to the next stage, stage four. The adventurous ones may, however, wander around the domain exploring its wonders and record everything in the cosmic memory. 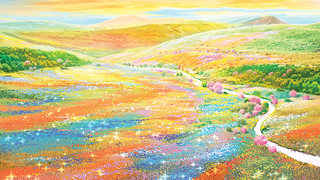 Spiritualists refer to this domain as the second heaven and many people who die come to rest in this second heaven, though it closely resembles an earthly life in that its inhabitants live in actual physical bodies, breath and so on. Attempts to communicate with the living happen here; although such communications are often wrong or confusing. This Myers’s third stage correlates with the stage in my version of afterlife, according to which an individual immediately after his/her death is waiting for rituals to be performed on the body and to be buried. It is at this stage that individuals develop strong emotional ties with their loved ones and may come back to haunt them. Depending on an individual, the evil ones come back to disturb their loved ones, while the good just come to make their presence felt but in a good way. The individual then proceeds to the stage four, the domain of color that has a lovely existence whereby all strong scientific, religious or philosophical affiliations disappear. A variety of new affiliations are created here and souls find more freedom to work with highly energized spirit and intellect. This domain is considered the third heaven. The righteous souls go through here without any struggle, but the troubled ones strive hard to reach it due to sojourns in the earlier stages. This stage corresponds to the stage in my version, according to which the emotional ties in the third stage begin to wither and the soul starts to develop ties with nature. This is manifested in such natural phenomena as thunders, lightnings, tornadoes, volcanoes and so forth. This affiliation to nature grows very intense, resulting into a whole new stage, stage five. In the fifth domain, the relationship between the soul and nature is so strong that it can wander the universe without being harmed by temperatures, turbulence or radiations and comes back with a more complete experience. The spiritualists consider this stage the fourth heaven. This stage, according to them, is a stage whereby materialistic desires are gone. Selfless souls work hand in hand to spiritually enlighten the lower levels of hierarchy. Inventions, moral and religious progressions, and spiritual leadership sprout here. Great talents may be sent back to the Earth for the reasons known to them. This domain corresponds to this stage in my version, according to which after the souls tour all places during their exploration of nature and see what needs to be improved or made, they oversee the appropriate inventions through specific individuals. These may be gifted with writing, drawing, lecturing or in leadership. If you like this post, please rate my paper online, thanks!